Chrichton's World: Review The Shallows (2016): And the Oscar goes to....Steven Seagull! Review The Shallows (2016): And the Oscar goes to....Steven Seagull! The Shallows couldn't be a more fitting name since for the most part this film is very superficial. It thinks it can get away with beautiful visuals and gritty action only. But it I will tell you why this film wasn't able to seduce me. The one thing that I really wanted but didn't get was nail biting suspense or at least some heart wrenching tension here and there. But nope apparently that was too much too ask. The problem with this film is that almost everything is a little too far fetched and unbelievable and far too convenient. How plausible is it that a woman who was supposed to go to this wonderful beach with a friend still would go after her friend cancels the appointment? Blake Lively's character Nancy is now all alone in a part of Mexico that is almost completely isolated. Ok, I am willing to believe that she is too stubborn for her own good and thinks she can manage herself just fine. But I hope you do agree with me that this is one of the most stupid things a person could yes? You wouldn't find me all alone in the middle of nowhere. If I remember correctly the guide who brings her to the place even asks if she will be fine on her own hinting that this isn't the kind of place to be wandering off all alone. This is slightly before she had asked him if there was uber in those parts. The guy gives the best answer anyone could, a look of total astonishment. Anyway, she decides to ignore whatever warning comes her way and sets out to surf. The only thing she has packed with her is one measly backpack and a smart phone. Oh yes, the phone. It has to be one of those magical ones, that never runs out of battery until the plot tells you. And that it has incredibly good reception and coverage. I can't even get one that good a room away and my apartment is quite small. But I digress yet again. So she starts to surf and yes I have to admit that these sequences offer some nice eye candy. Actually the whole film is very nice looking. You almost believe you are in some kind of paradise. While in the water she discovers two guys and they chat a bit but don't pay her that much attention. We are in the middle of nowhere, a reasonable attractive woman, a beautiful beach that is the closest to what seems like paradise on Earth and these guys don't even strike up a decent conversation with her? Come on. I don't buy that. Only briefly after they leave we see one possible reason why this does not happen. Very lame excuse and very poor method of inducing tension. Now Nancy has been in the water for a while but doesn't seem to be in a hurry and this is when the real event starts. Out of nowhere a shark comes at her and he is incredibly hungry. I liked these bits but to be honest I never felt terrified or scared for Nancy. Because I couldn't get past for her being so stupid to be all on her own. I didn't dislike her which is to credit of Blake Lively but that is all the sympathy I could muster for her. Nancy ends up on a rock with a seagull that for the duration she is on there is her companion. This seagull steals every scene he is in. I don't know about you but that is not particularly a good sign for the film. If you care more for a flying rat that affectionately is called Steven then you probably realize how bad this film is. To be fair he is a truly amazing actor and even the best in the bizz would have trouble upstaging him. I was willing to overlook the tired cliché of the dangerous and relentless human eating shark but without a hint of suspense he could have been a giant octopus and it would not have mattered. 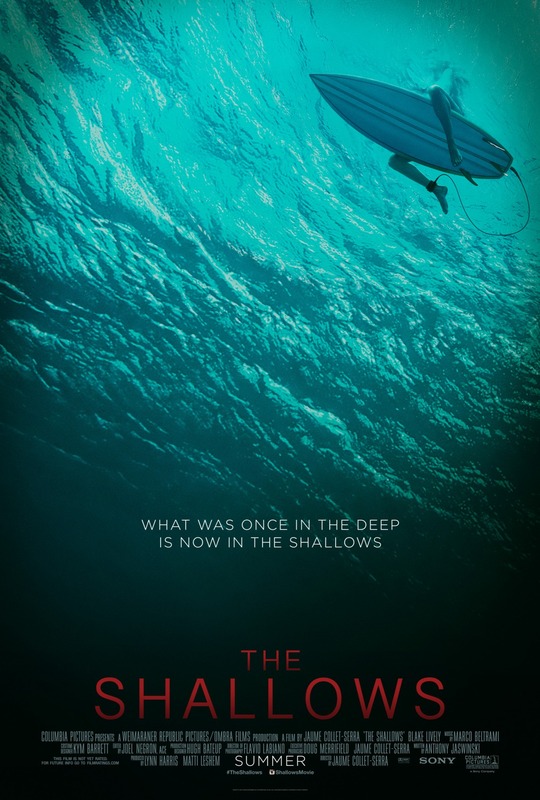 The Shallows is pretty boring overall and if I had been watching this film alone I would have shut it off and never thought of the film again. So I do believe that this is one of those horror films you should watch in company so that you can laugh about how ridiculous it is. I do hope to see more from Steven Seagull but somehow I think they will do whatever they can to block him from Hollywood. Yes, he is that good. He would destroy Leo and Cruise.